“People of faith cannot escape, nor should we want to escape, the expansion of perspective on the cosmos that he has given us." Archbishop Michael Jackson of Dublin and Glendalough. Pic courtesy: United Dioceses of Dublin and Glendalough (Church of Ireland). 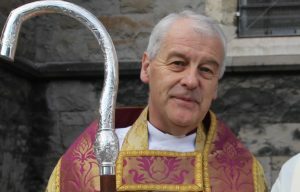 The Church of Ireland Primate of Ireland has said that living out a life of faith in a post Stephen Hawking era is not easy but people of faith cannot “pretend that science does not exist”. In his Easter homily at Christ Church Cathedral, Archbishop Michael Jackson of Dublin and Glendalough said that physicist Stephen Hawking had done more in our day than any other single individual to show us all that science is not going away. He noted that Professor Hawking had held that given the laws of physics, nature drags itself into existence and there is no need for a creator. In expounding this argument, Hawking effectively seemed to hold that religious people think of the universe as being like a model railway track and God as setting the train going, the Archbishop commented. However, from a theological point of view, creation out of nothing is not about setting procedures and processes in motion; it is to assert that God is at work at all moments and it is to concentrate on relation as pivotal to a theological understanding of the universe, Dr Jackson stated. “God is not someone we, as theological beings, would expect to find at some temporal edge,” he told his congregation. “What I am saying is that for a person of faith, the cosmology of Hawking asks more not less of us as people of faith in relation to three fundamental questions coming directly out of Easter: Who is my neighbour? What is my community? Who will call my name?” he said. According to the Church of Ireland Primate, Hawking challenges us to set aside the rhetoric of denial that is such a feature of The Passion through which we have just travelled and “which still ricochets so noisily through Irish life today”. He said the courage of Stephen Hawking to shed light in dark holes and to journey fearlessly into and through knowledge was an inspiration of the human spirit. Elsewhere in his Easter homily, Archbishop Jackson addressed the forthcoming twentieth anniversary of the Good Friday Agreement on 10 April. He said Ireland North and South was “finding that progress was a tiresome friend”. Love, he suggested, no longer seems to be a public virtue.